Inspector General of Police N.K. 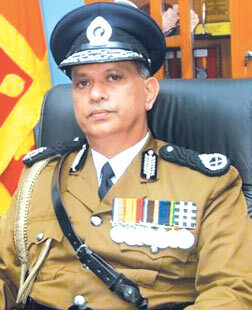 Illangakone who joined the Sri Lanka Police in 1980 and promoted to its highest rank as the 33rd Inspector General of Police in June 2011 will retire on April 11. Having served the Department under the Special Police Task Force for over 11 years and facing the battle with the LTTE, he is the only IGP in the recent past who received the Police Bravery award, Deshaputra Sammanaya. As a DIG he served in key positions across the country during crucial times and was appointed IGP in 2011 when the country was undergoing changes in the post conflict scenario. He said he had done his duty by the country to the best of his ability and says that it should be judged by the people of the country. During his tenure he raised the crime solving rate from 34 percent to 59 percent and had addressed the long felt grievances of the Police officer. Q: At the time you were appointed IGP it was a post meant to serve the ruling government and the politicians. Do you think that you could change that scenario and do justice to the post of IGP? A: Yes, I am happy that I played a vital role during my tenure. My objective was to serve the public and I did not have any other agenda. What I was aiming at was to do the maximum for the people. Whatever I did was for the people. I worked towards that objective. Success and failure were part of it. On the whole I was able to do something to the country which has to be judged by the people themselves. Q: As IGP you have to work under political pressures from the government and from politicians. How did you manage the political pressure and influences? A: Political interference can be interpreted in different ways. Some people say there is political interference and some say there is no political interference. My opinion is that if we do our job properly and if we don’t leave room for others to criticize and if we do not leave room to interfere in our work these problems will not obstruct work. That is how I look at this problem. When I was serving as Gampaha SSP a politician thanked me for reducing the number of people who came to seek favours. We must maintain our status and build our image by not violating rules and regulations and accommodating requests of politicians which is not just. If not people seek political backing to get things done. Q: That means as the IGP and as a Police officer you acted in an unbiased and impartial manner? A: I always try to make just and fair decisions and I feel that I did my best. That has to be decided by the people themselves. Q: What major changes were you able to effect during your tenure to improve the police service? A: During the three-decade war the police service was badly affected. After the end of the war the expectations of the people were high. They wanted freedom in a crime free society. That was the responsibility of the Police. To change the war mentality of the Police officers we had to conduct several training programs. Over 30,000 police officers were given special training with the support of universities in the country.That was a challenge I had to face when I became the IGP. When I took over as the IGP the crime solving rate was 34 percent in 2010.We increased it to 59 percent by 2014. All that was possible because of the training and new methods we adopted to solve crimes. There were about 60,000 warrants accumulated during the time of the war. I am not blaming anybody because during the 30- year war we could not do our duties properly. So we cleared all of them and most of the culprits were taken to task. By doing all that the criminal activities were controlled and crime solving rate increased to 59 percent. Q: What steps did you take for the betterment of the Police officers and improve their standards? A: There were lots of problems regarding the salaries of the Police officers and their welfare. In 2013 we increased the allowance of the Police officers which was done for decades. We also streamlined the process of providing uniform materials in time. The major problem among Police officers was the absence of a permanent transfer and promotion policy. During my career I appointed a team of senior Police officers to prepare a permanent transfer and promotion policy and they prepared it. Now it is with the Police Commission and once its is approved it will fulfill a long felt need of Police officers. We need to increase the salaries of the Police officers. The government agreed to increase by Rs.3000 in the budget. The criteria for salary increases have to be worked out and its upto the next IGP to take it up. Another issue that has to be resolved is increasing the cost of living allowance of the Police officers. We need to do it to improve the living standards of the Police officers to maintain professionalism. Apart from that we also need to introduce an insurance scheme for the Police officers to pay compensation for accidents while on duty. Q: Police officers were criticised for using torture and illegal methods in crime solving. What are the new mechanisms you introduced to the crime solving process? A: There were complaints against the Police over torture. But the number of torture cases has dropped drastically.There is a reason for that. We are introducing technology in crime solving. Last week we introduced a crime data anlysing software. Now we have access to a data base of all criminals. So many crime records are now available. That is important for investigators. When the Police arrests a suspect in a couple of minutes they can know whether that person is in the wanted list or whether he or she has any criminal records. With the introduction of the automation finger print analysis system we can identify the finger prints from the 600,000 finger print data bases in a minutes time. Earlier it took months to do the analysis. Q: There were some incidents which brought bad reputation to the Police. The Seya Sadewmi case, the attack on HNDE students by the Police and the Embilitpitiya case are some of them. Don’t you think that those incidents could have been avoided if the Police acted professionally? A: The police took over the investigations on the Embilipitiya incident. Then due to criticism investigations were handed over to the CID. Now the ASP has been arrested and he is in remand. They are doing their job properly. Other than the ASP they have not arrested anybody yet. There has to be evidence. CID is a professional investigating body and they will do it professionally. The Attorney General is also following the case and we are waiting for the final decision. There were allegations that a particular Police officer was my personal security officer. Until I became the IGP I never had personal security officers. I categorically deny the allegation. Now the CID is conducting investigations and people will be able to see the outcome. Q: There were allegations that the FCID which was formed by the present government was used as a political tool to harass political opponents of the government. Do you agree with these allegations? A: If we are have caused injustice to anyone he could go before courts and seek justice. Some have already gone to court. There are two cases pending in the FCID. Therefore I don not want to comment on the FCID . Q: In the past we saw some investigations were held back or suspended due to various reasons. But those cases are now being investigated under different officers. For instance Vassim Thajudeen’s case is now being investigated. What was the reason to hold back investigations and who should be blamed for it? A: When a crime is committed investigations are carried out initially by the area Police. Sometimes the case will be handed over to the CID, Colombo Crime Division or FCID. Some of these cases were investigated by the area Police. Since they have not been solved a few of them were handed over to the CID. They will do their best to solve the cases.